1. 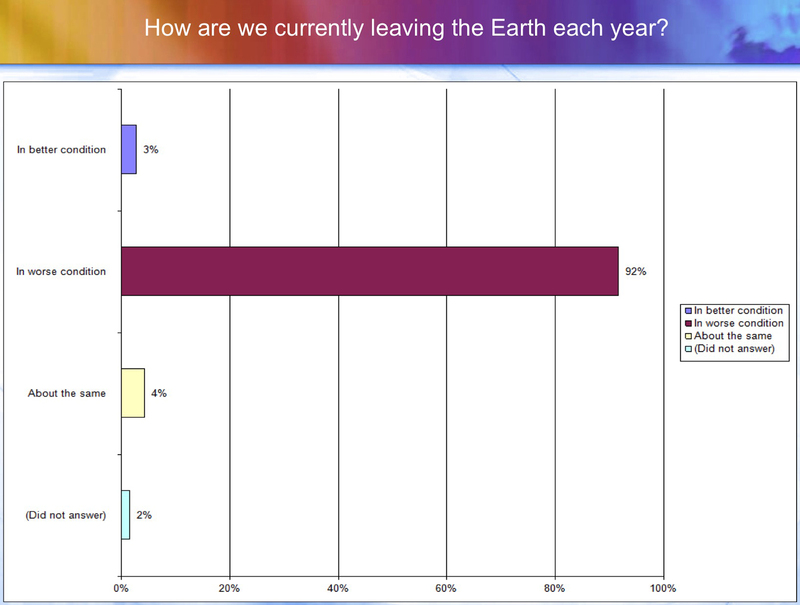 How are we currently leaving the Earth each year? A whopping 92% of respondents understand that we’re currently injuring Earth’s ecosystems, each year leaving the planet a little less capable of supporting our massive global population and economy. 3% feel we leave the planet in better shape each year. I imagine they are CEOs of asphalt or concrete companies. 2. 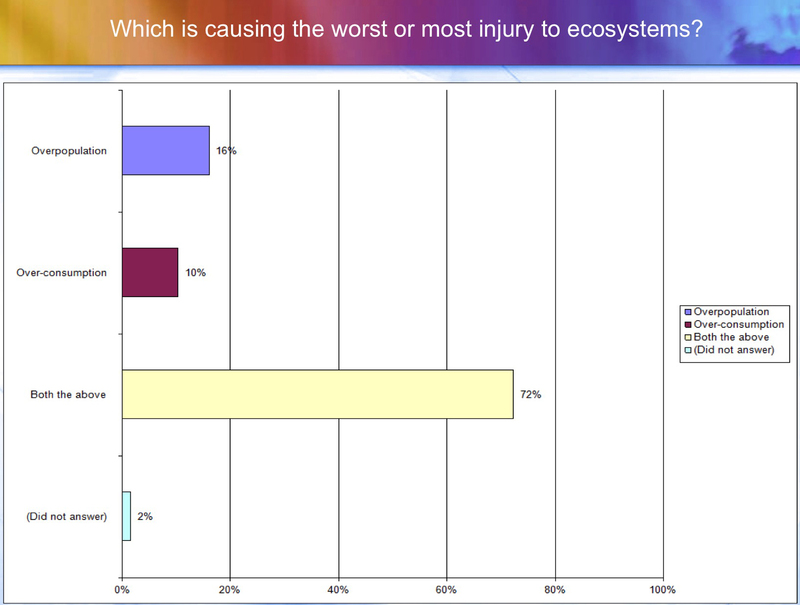 Which is causing the most injury to ecosystems? There was no right or wrong answer to this question. It will be debated till we’ve run human civilization off a cliff. 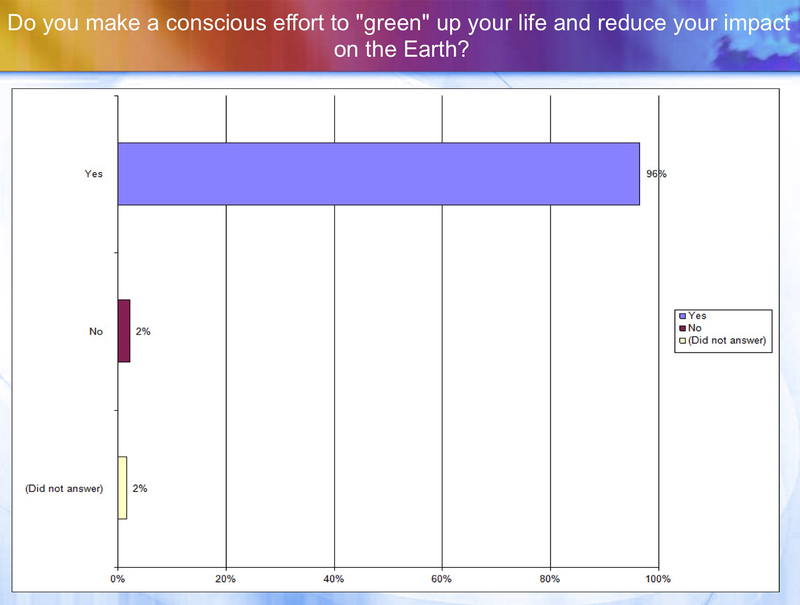 An impressive 72% chose BOTH overpopulation and over-consumption, avoiding the debate. The famous Ehrlich/Holdren IPAT formula tells us that population and consumption multiply one another. Global Footprint Network estimates we are so far into overshoot that every year, by August, we’ve burned through resources the Earth needs a year to replenish. With our overshoot being that significant, we need to be contracting both our consumption and population. 6. Do you make a conscious effort to “green” up your life and reduce your impact on the Earth? 7. 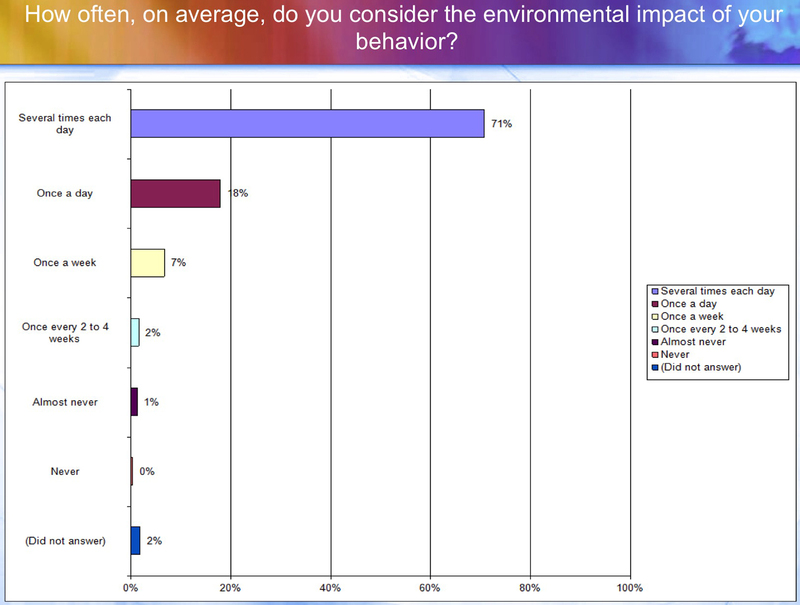 How often, on average, do you consider the environmental impact of your behavior? As I confessed when I launched the survey, I consider my impact many times a day – every time I enter a building and hunt down the stairs so I can avoid the elevator, every time I skip the paper towels and grab a cloth rag to wipe up a spill. The list goes on. I really figured I was an outlier on this. But look at the results! 7% evaluate the impact of their behavior maybe once a week. 18% do this once a day. But a whopping 71% self-evaluated as thinking about this several times throughout the day. That really surprised me, in a very pleasant way. I’m glad to report this great news. Full disclosure, however: this survey was not scientific. We did not do a random sampling. We invited and attracted people with genuine concerns about environment and sustainability. Still, I am thrilled to have company. There’s probably a blue pill to treat this kind of obsessive-compulsive behavior, but the planet, and human civilization, need this kind of compass guiding the way we all behave. 8. Please rank these green behaviors from greatest impact (1) to least impact (12) on a person’s footprint. More respondents correctly identified “conceiving one fewer child” as making the most difference. An Oregon State University “carbon legacy” study determined that, in the United States, the carbon legacy and greenhouse gas impact of an extra child is almost 20 times more important than some of the other environmentally sensitive practices people might employ their entire lives. Other behaviors ranked high in our survey for reducing impact included replacing fossil fuels with renewable energy, and eliminating meat from the diet. Interestingly, replacing light bulbs with LEDs and adjusting your thermostat were ranked lowest. Check out the full survey results here. If you want to be invited the next time we do a survey, you can sign up here to be on our survey list. MAJOR NEWS: We’re experimenting with a new webinar series, and I invite you to join us, free, for the first one: Overpopulation: The New Conversation. Register now to reserve your place. Would you like to see us do more surveys and/or webinars? This non-profit project is fueled by people like you. Please join other sustainability advocates and set up a modest automatic monthly donation. Thank you. This does not include the questions about how likely we are to improve. I was surprised at how pessimistic most people were. I am optimistic about the future in the long term, although things are going to be unpleasant for a while until they improve. Thanks for bringing that up, Joan. There were a few other items warranting comment, too. In the interest of not writing War and Peace, I opted to save those subjects for another day. So we shall have that conversation about the pessimism. Many thanks for running this survey and for truly understanding the issues related to our impact on the planet’s ecosystem and species. You’re welcome. It’s important stuff. Thanks for appreciating it. I hope you’ll share and support our work! Have you looked into Peter Joseph’s ideas that he presents in Zeitgeist 4 and Zeitgeist 5? I think he is right that the system itself invariably leads to the environmental, social, economic, political, and moral problems that humanity doesn’t seem able to solve. At the root of that system is sociopathy and its tendency to deceive and manipulate in the pursuit of power and control over others. The money system has become the sociopaths’ greatest tool employed in that process. Addressing symptoms like overpopulation and environmental destruction only offer temporary reprieves. The underlying problem, the fundamental design of the system, will have to be changed. I looked at Zeitgeist back in about 2009 or 2010, and I don’t buy that there is technology or a system that will allow us to serve 10 billion on Earth, or even 7, in perpetuity. At least not in the real world. Zeitgeist 4 and 5 are more recent. You should look again and temporarily quiet your beliefs about the carrying capacity of the world under the current system, which is indeed fatally flawed. Keep in mind that under a completely new system that actually starts with the sustainable carrying capacity of the world, things would be completely different. I’ll try to take a look when I get a chance, but my distrust of techno-fixes won’t take a rest. They are a trip to the tables in Vegas, while reducing our population is not a gamble. Results guaranteed! I think what Hugh is saying is not that population is not the problem, but that if we only focus on overpopulation and not on the system that creates the overpopulation, we will never be successful at reducing population. I never advocate focusing only on overpopulation.